Fun. That’s where this review starts. Jules Verne Forever is a fun album. Although it’s a tad lighter and boppier than my tastes normally run, it’s so crammed with effective hooks and shiny melodies and sounds that ricochet off my Jean-Michel Jarre and Azuma memories, I can’t deny that when I’m in the right mood, I quite like it. 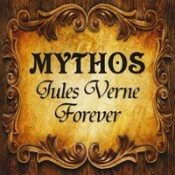 Mythos (aka Stephan Kaske) brings a full-on symphonic electronic feel to his tales and inflates them with the kind of pomp and wonder Verne was known for. No trope is spared in this familiar voyage, but neither are any of them too egregiously overused. Swirling synth-winds, spiraling electro-sounds, the ever-popular choral pads, you get them all here but they all fit in nicely. I don’t hear a great deal of structural variation in the ten pieces here—they’re all pretty much chugging sequencers, chords packed with extra drama, and lots of twinkling things—so the real differentiation comes via small elements in any given track. The opener, “The Mysterious Island,” takes up a world feel through drumming. “Eight Hundred Leagues on the Amazon,” which sounds amazingly like Azuma, distinguishes itself with what I’m moved to described as a steampunk-flavored rhythm. You can practically hear the gears and pistons over the flowing pads. “A Drama In The Air” has so much Jarre influence in it, it about spills over into being a tribute. Or, honestly, derivative. But damn, is it fun. As I set aside Jules Verne Forever, having reviewed it, I’d say it’s an album I’ll hang onto but enjoy more when it’s shuffled into other works. I do like it, but in doses. Kaske’s a superb musician who knows how to build a storyline through sound, and his work is extremely catchy. Sadly, it tends to be too similar, piece to piece, and a touch too light to hold my attention for the full 80 minutes. Listeners whose tastes fall more into a classic New Age framework will quite likely greet it more enthusiastically. There is energy and fun aplenty here, so do have yourself a listen. Available from the Mythos web site. There you can above all listen to soundclips of all ten songs! Thank you for the information, Stephan!